What it is: A pop up gallery featuring four Vermont Artists just in time for the holidays. I will have many limited edition pieces and specialty items in the gallery. Watch my Facebook page for daily updates on my featured work of the day. Jessica Putnam-Phillips is a US Air Force Veteran, ceramic artist, Illustrator, author and owner of Battenkill Pottery in Arlington. Her unique hand-carved functional porcelain and stoneware pottery surface designs are inspired by Crewel embroidery and French tapestry. 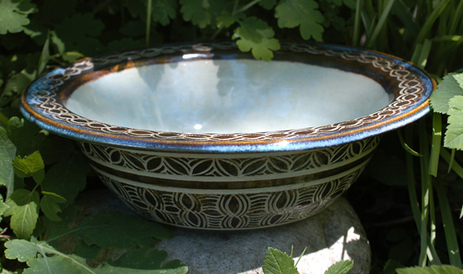 She incorporates traditional shapes with contemporary glazes and a modern color palette. Jessica recently returned from a five week residency in Vallauris, France where she studied the ceramics of Pablo Picasso and created a new series of work inspired by the French Riviera. Jessica's work has been included in numerous exhibitions including the Boston Young Contemporaries and the New England Collective.